This month marks a very special occasion for one of the UK’s most respected sneakers website, Crooked Tongues. 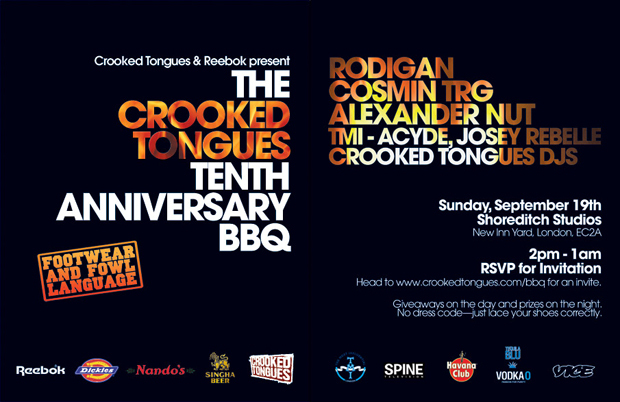 To celebrate the fact they’ve been rolling for ten years now, Crooked Tongues and Reebok have teamed up and gone all out to make this years CT BBQ a certified banger. Sir David Rodigan will be stepping up on deck to headline the celebrations, you know this is going to go off. The rest of the line up ain’t half bad either… The likes of Cosmin TRG, Alex Nut and Crooked Tongues DJ’s will also be providing beats and bass. If that isn’t enough, Nando’s will be providing chicken throughout the day. The sheer volume of dope kicks on show will be off the richter scale, sneakers, chicken and bass. Sounds amazing doesn’t it. The BBQ will be held on Sunday, 19th September at Shoreditch Studio’s from 2pm – 1am. Lace up those special ones you’ve been keeping on ice, and RSVP on Crooked Tongues to make sure you secure your invitation. Free kicks every week for a year!